A library of 99,400 chemical compounds analyzed by gas chromatography, including 404,045 GC method and retention index citations from literature. Supersedes the 2014 version. Search for compounds based on name, synonym, CAS number, chemical formula, elements present, fragment name, or retention index range. It also supports structure similarity search to locate related compounds similar in structure to given compound in the database (or imported .MOL chemical structure file), sorted by degree of similarity each with displayed structure. The search results for individual hits can be constrained by column type (packed or capillary), stationary-phase type (polar or non-polar), GC temperature conditions (isothermal or temperature programmed), and/or retention index type (Lee or Kovats). View information on a compound, such as name, synonyms, formula, and MW, along with a list of GC methods previously used to analyze that compound (GC column type, GC method conditions, measured retention index (RI), and literature citation with paper title). Predict retention indices (RI) from the cited values of the given compound or structurally related compounds in the database. Both experimentaly measured RI values and those estimated based purely on structure are provided. 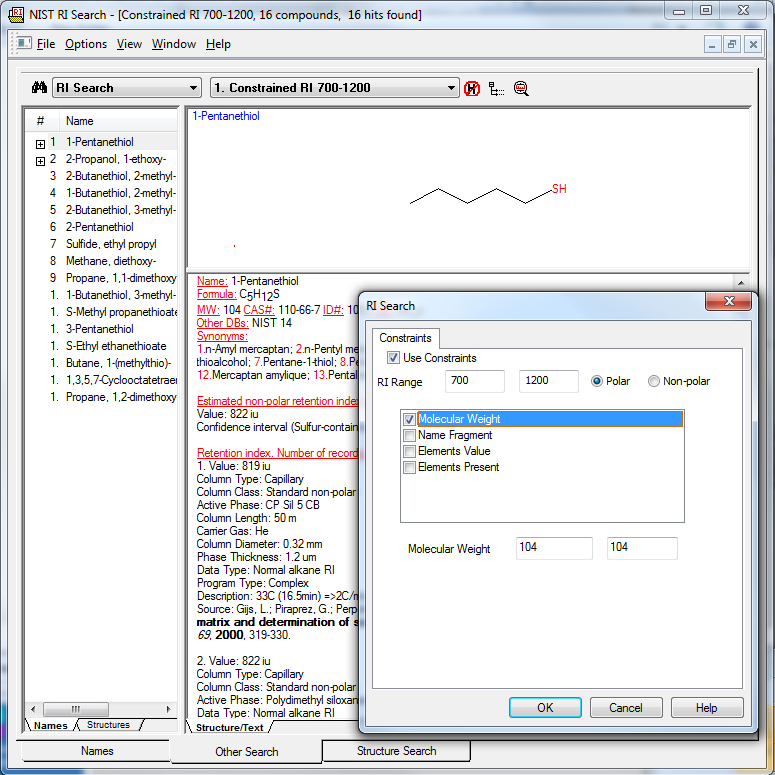 The software can also predict retention indices from an unknown imported chemical structure (.MOL file, which requires having an external structure drawing program). (*) Each with name, synonyms, chemical formal, chemical structure diagram, number (e.g. CAS). The NIST 17 GI/RI Database contains 99,400 compounds common in GC analysis. Each has a name, synonyms, chemical formal, MW, chemical structure diagram, ID/CAS number, and one or more GC data sets (GC column type, GC method conditions, retention index, and literature citation pertaining to the compound). There are 404,045 retention index values total. Included search program to search, browse, and view the database (screenshot). The database and search program are a subset of the renowned NIST MS (NIST/EPA/EPH) Mass Spectral Library. It differs in that it contains only the GC information (no MS information), is under one-fifth the cost, and the search program is a bit more streamlined for GC data searching. NIST Number: Example: 2079298 (e.g. XMGQYMWWDOXHJM-UHFFFAOYSA-N), ID (e.g. 33687), CAS Number (e.g. 138-86-3), and NIST NIST Number (e.g. 79639). The NIST Retention Index Database provides retention index data and gas chromatographic conditions for compounds on polar and non-polar stationary phase used with packed and open tubular columns. Each citation (retention index value and GC method) contains the complete bibliographical information and title of the research paper it was taken from. Details of the gas chromatographic method used to obtain the retention index are also provided. If a compound is in the NIST/EPA/NIH Mass Spectral Database (NIST MS), it is so noted in the text information provided about the compound. There are 72,361 such compounds. Many of the compounds are indexed by multiple names (Synonyms). All the compounds are indexed by elemental composition (Formula), nominal mass (MW), Chemical Abstracts Services registry number (CAS#), and a sequence number corresponding to their position in the NIST Retention Index Database (ID#). In addition, estimated non-polar retention index (n-alkane series) values, based on structure, are provided for each compound. Quality: The NIST GC Database was developed by the same people at the National Instruments of Standards and Technology (NIST) who brought you the NIST (NIST/EPA/EPH) Mass Spectral Library. Most index values were abstracted from the open literature and then compared to replicate values (about 10 per compound) and estimates to find and remove errors. A search program (nistmsri.exe) is included for browsing, searching, and viewing the database (screenshots below). Data can be retrieved through an incremental name search, a CAS# search, a MW search, a formula search, or a structure search. In addition, the database can be searched by multiple variables that can be used to constrain the above-mentioned searches. A search can be performed over a molecular weight (nominal mass) range. A search can be constrained to the elements present and/or the number of each element present. Searches can be constrained for name fragments present in the main database name and in the synonym list. The search results for individual hits can also be constrained according to column type (packed or capillary), stationary-phase type (polar or non-polar), GC temperature conditions (isothermal or temperature programmed), and/or retention index type (Lee or Kovats). 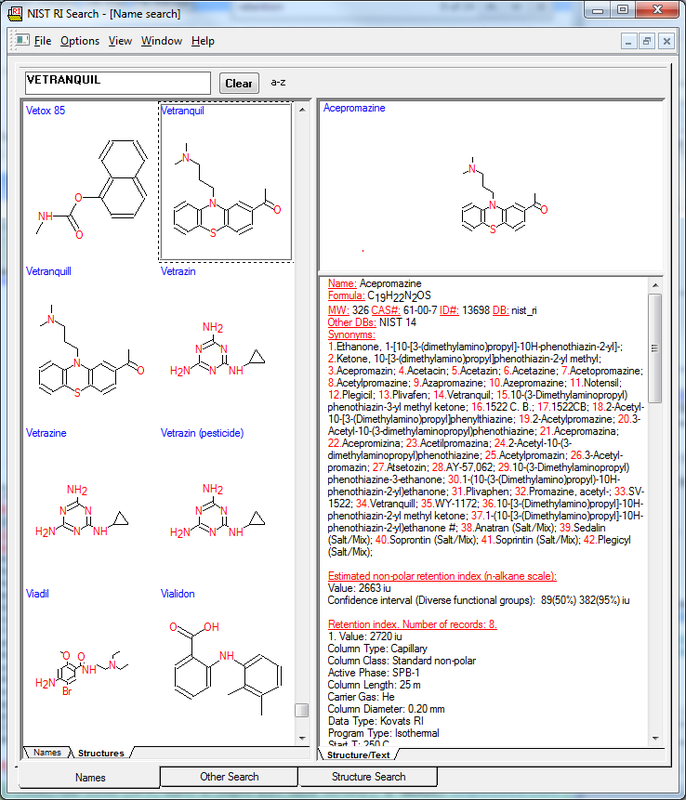 The program has three tab-activated windows, each window having its own specific functions: Names Window (where searches by compound name (main database name) or synonym are carried out); Other Search Window (which is used for Formula, CAS#, MW, or the Sequential Method searches); and the Structure Search Window (where a list of compounds is produced that have a similar structure to a submitted structure). The general features of all windows are described in more detail in the program help file. 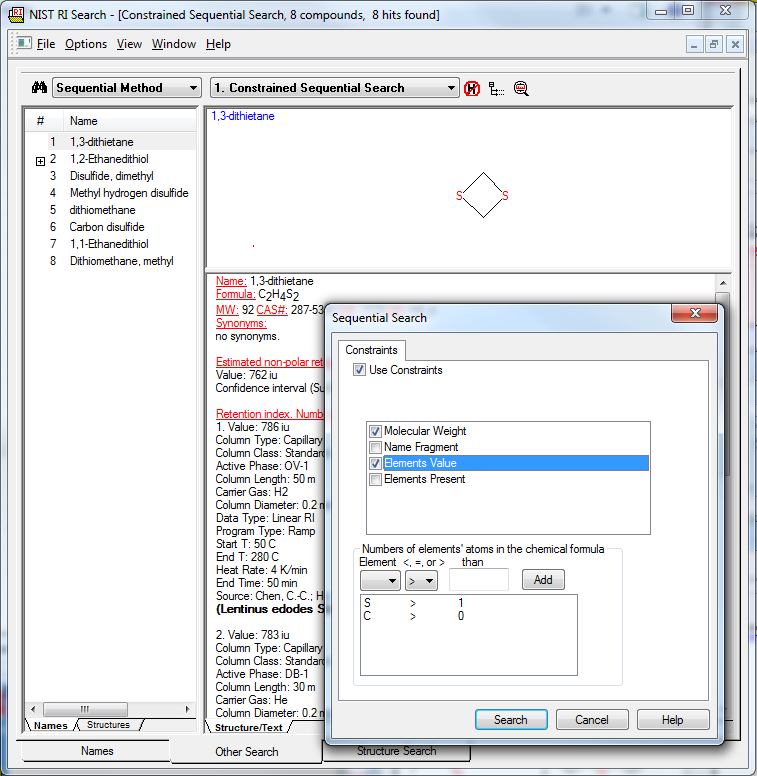 The following screenshots illustrate basic usage of the search program. The program contains three tabs at the bottom for selecting different modes of searching and browsing. Each tab has multiple panels to display data. Figure: Typing the first letters of the name "Vetranquil", or any synonym, brings up a list of similar names and chemical structures (left). Selecting one of these compounds brings up details on the compound (right). 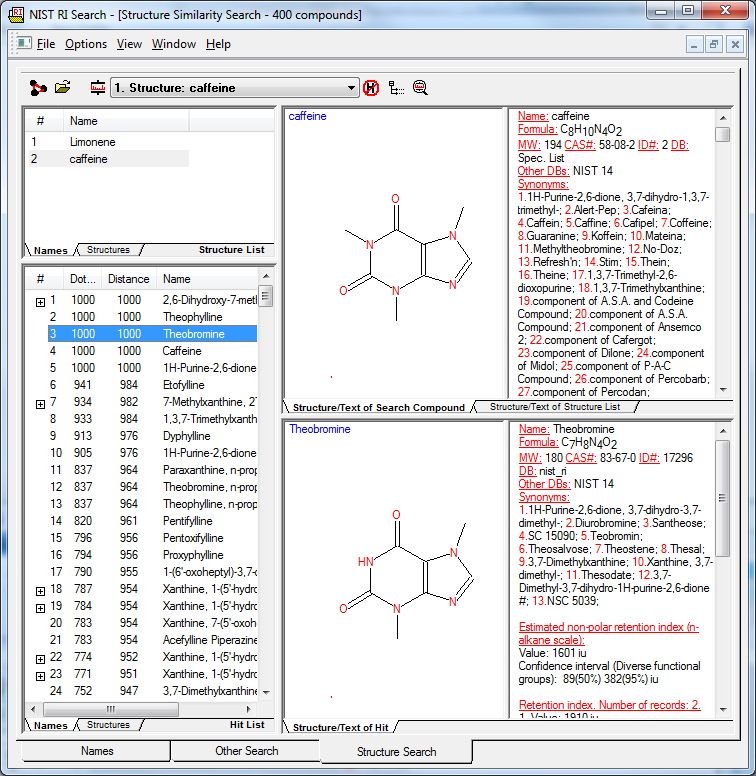 Figure: The structure similarity search option displays a list of all compounds with a structure similar to the selected compound, ranked by similarity ("distance"). Here we see that caffeine is structurally similar to a number of compounds, including theobromine (differs only by a CH3 group). Figure: The retention index (RI) search option displays a list of all compounds with a given range of retention indices. The results can be further narrowed by other constraints like GC column type and compound mass. The NIST GC Retention Index Search Program is compatible with Windows 10, 8.1, 8, 7, Vista, and XP SP2. Which GC datasystem you have does not matter. Unlike the full NIST MS 14 database, the NIST GC library software does not need to interface to GC data systems (e.g. ChemStation, Xcalibur, Saturn, etc.). The database and software use 390 MB of disk space. Package consists of one CD containing the installer for the database and software program. The documentation is included on the CD and contains a Windows help file. There is no demo of the NIST GC library itself. However, you may instead try out the demo of the full NIST MS (plus GC) library. The NIST GC library is a subset of the database and search software in the full NIST MS library--it contains only the GC parts as shown in the above screenshots and only contains compounds with GC retention indices. Furthermore, the demo version contains a much smaller database than the full version. Therefore, the demo is only intended to provide a general idea of the user interface and operation. The full NIST MS library contains everything in the NIST GC library (#841010GC) in terms of data, but there are some differences in the search software. The NIST GC search software is a bit more streamlined for just doing GC only lookups, as it omits the MS stuff and also supports a full "retention index search". Screenshots of the NIST GC software are above. Searching compounds by GC retention index is only in the NIST GC software. The full NIST MS software does display GC retention indices for matching compounds but doesn’t provide a function to search by retention index like the NIST GC software. The NIST MS software (as of version 2014) does have a new option to utilize the GC retention index associated with a mass spectrum being library searched when ranking spectral matches (seen here), but this requires having a mass spectra and doing a spectrum similarity search. Unlike the NIST MS software, the NIST GC software does not communicate at all with your GC/MS data system (e.g. Agilent ChemStation/MassHunter/Thermo Xcalibur). It doesn't need to. It's completely stand-alone. If you have both GC/MS and GC (without MS) instruments, you might consider the full NIST MS Library for the GC/MS and only #841010GC for the GC (without MS). Related product: See also the NIST MS Database if you need a library containing both GC and MS information (not just GC).